Japan is looking for an Electronic Warfare aircraft. Japan tests Boeing EA-18G Growler. On June 12 some Japanese spotters posted photos of two Boeing EA-18G Growlers with Japan Air Self-Defense Force markings. According to a document published by the Japanese defense ministry, the nation is conducting some tests to evaluate a future electronic warfare aircraft. The shots show a Growler flying in formation with a Japanese Kawasaki T-4 trainer jet, both aircraft brought the marks of the JASDF Air Development and Test Wing based at Gifu AB. Japan is looking for an plane able to neutralize enemy air defenses and command systems remotely, blurring the line between strict self-defense and offensive base-strike capability. The country is currently exploring a range of options including the Boeing EA-18G Growler. The Defense Ministry intends to include a SEAD-dedicated aircraft into its Mid-Term Defense Program that will be revised at the end of 2018 to buy several jets between 2019 and 2023. 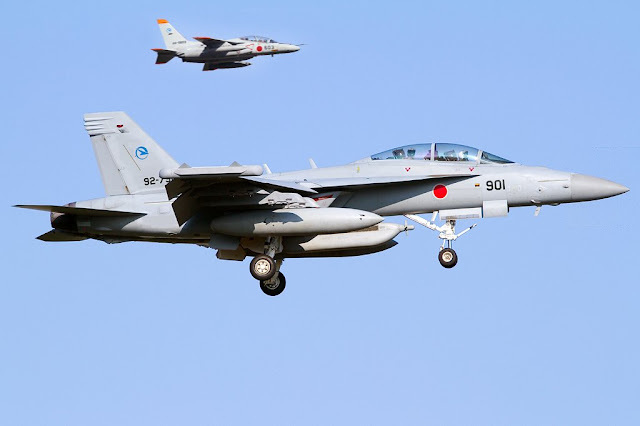 Boeing and Japan have established excellent business relationships over the years, most of the aircraft belonging to the JASDF fleet have been supplied by the Chicago-based company. Japan is also the first foreign customer of the new Boeing KC-46 tanker aircraft. Note: we can't confirm if this image is real or a fake, we are still waiting for an an answer from U.S. Navy as suggested by Boeing.